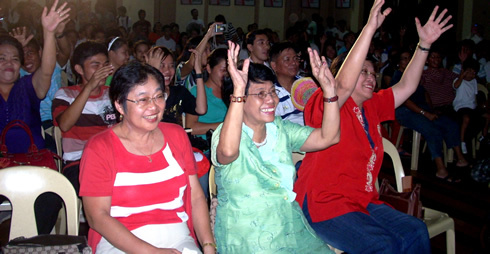 WMSU officials (from right) Dr. Grace J. Rebollos, President; Dr. Felicitas F. Falcatan, VPAA; and Dr. Gloria Florendo, Dean, College of Nursing give the deaf and mute applause. Amidst all the glitter, fun and gift-giving, let us remember Jesus, the reason for the season (advent). This was the core of the message of Western Mindanao State University President Dr. Grace J. Rebollos during the Hanging of the Greens on December 3 at the WMSU social hall. Dr. Rebollos pointed out that at this at time of the year, we all experience people’s innate goodness, kindness, love and compassion which come from God himself. The annual Hanging of the Greens formally opened the 2010 advent celebration in WMSU. It was facilitated by the Office of Culture and the Arts, the College of Home Economics, College of Engineering and Technology, College of Education, Supply Office, Food Service Center, College of Criminal Justice Education and the University Security Force. It highlighted the hanging of the following Christmas symbols by various officials of the university, to wit: fir tree – hope for mankind; star – heavenly sign of the promise of a Savior; candle – Christ as the light of the world; wreath – real nature of love; ornament – generosity and good will; hollies – immortality; gifts – unspeakable gift of a Savior from the heavenly Father; candy cane shepherd’s crook; angel – heralds of the good news; and bell – guidance and return. The happy occasion also featured a caroling contest, and the search for the best lantern and the best “Belen” which was participated in by the various colleges. Winners of the caroling contest were the College of Nursing (CN), first place; the College of Education (CED), second place; and the College of Liberal Arts (CLA), third place. The College of Science and Mathematics, CED and CN bagged the first, second and third prizes, respectively, for the Belen contest. The winners for the lantern contest were: College of Home Economics, first place; College of Science and Mathematics, second place; and College of Nursing, third place. Other highlights of the event were the Christmas tableau mounted by the College of Education which featured children with special needs whose participation provided depth and meaning to the presentation. The University Theater Guild, the Jambangan Dance Troupe and the WMSU Grand Chorale also showcased their talents which delighted the audience. Manwhile, the annual WMSU Palaro 2010 kicked off on December 5 with a grand athletic parade; lighting of the event torch by WMSU President Dr. Grace J. Rebollos; a message from Hon. Ma. Isabelle Climaco-Salazar, congresswoman, 2nd district; the annual cheer dance competition; and the much-awaited magnificent fireworks display. Dr. Rebollos, in her inspirational message, lauded WMSU achievers, some of whom are athletes, for bringing pride and honor to the school. She especially mentioned Abbas Askari, a 5th year engineering student of WMSU who bagged the championship title in the 29th National Civil Engineering Students’ Quiz held in Mandaue City recently; Rhudaina Zakaria Mohammad and Kenneth Sutacio Besorio who ranked 5th in the Bachelor of Science in Education (BSED) and 8th in Bachelor of in Elementary Education (BEED) categories, respectively during the recent Licensure Examination for Teachers (LET); and the WMSU Judo Team who will represent the country in an Asian competition to be held in Japan early next year.